“We have two ears and one mouth, and we should use them proportionally,” writes Susan Cain, the author of Quiet: The Power of Introverts in a World That Can’t Stop Talking. Published in 2012, The New York Times bestseller upends society’s misconceptions about introverts and those who are drawn to listen rather than talk. Quiet and attentiveness to others is something the Congregation of Holy Cross has embraced for more than 180 years. This is because listening is a holy act. And by happy coincidence, many of the stories featured in this issue of Vocation E-News are about the power of listening. Read about Jubilarians Bro. 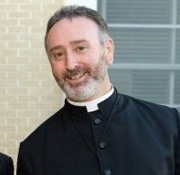 Francis Feeley, CSC, Bro. John Nicpon, CSC, Bro. Gilbert Pretto, CSC and Bro. Richard Kiniry, CSC and you will discover that while their vocation took them to different ministries and places around the world, they all listened to the call of God. Bro. Nich Perez, CSC is listening to the grief of others and documenting how it can become art in a film project titled The Art of Grieving. This process is also a ministry that can help others who are suffering from the loss of a loved one. In the past few months, we have also learned a great deal by actively listening to students at our Holy Cross schools and providing the opportunity to voice their concerns and hopes for the Catholic Church for the XV Ordinary General Assembly of the Synod of Bishops in October. At Holy Cross San Antonio, more than 300 students, the entire student body, participated in Listening Sessions as part of Project Hope 2018. It is listening to each other, God, and especially our own inner desires and aspirations that we find our authentic selves, the selves that God calls us to be — joyful people using our gifts and talents in service to others. With the second annual Religious Brothers Day upon us this Tuesday, May 1, I hope these stories encourage you to contemplative prayer and to listen to where God may be calling you in your own life.